We are saying this instead of the usual ‘don’t vote, organise’ as it takes the focus away from just ‘not voting’ and confronts the media myth that those who don’t vote or don’t get engaged by the general election must be ‘apathetic’ about the state of things under the capitalist system. It’s ready. Download it, or read online, and please spread the link! 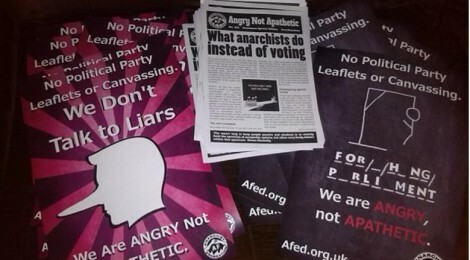 Contents: What anarchists do instead of voting, Labour and the Unions, Lib-dems: a student’s view, Green Party “Tories on Bikes”, Syriza in Greece, Suffragettes, Russell Brand. 8 pages.